Woodbury, CT – On Wednesday, April 11th Schwenke Auctioneers held a Fine Estates Auction with an offering of 450 lots of freshly consigned estate property from estates in Fairfield County, Connecticut; New York City and Buffalo, New York; Morristown, New Jersey; and property from the collection of a Westchester County lady. Property offered included a broad selection of Asian decorative arts, American, English and Continental decorative arts, folk art and American country furniture, early English & other sterling silver, jewelry, fine art, miscellaneous decorative arts, and estate oriental rugs. The auction was a live online sale with absentee and phone bidding, plus live internet bidding on multiple platforms. 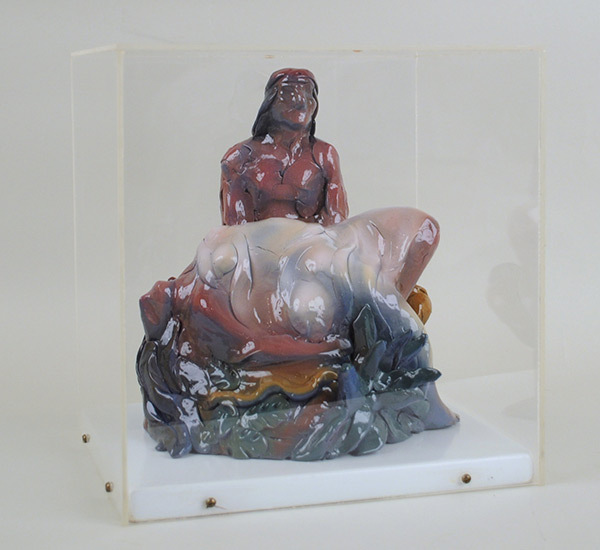 The top lot of the sale at $24,400 (est $4,000-6,000) was a rare Luis Jimenez fiberglass/resin sculpture entitled “Southwest Pieta”, signed “Luis Jimenez” and dated 1983 on base, presented in a plexiglass case together with two autographed artist’s catalogs. The 9” high, 8” wide, 7” deep work had been purchased from Lew Allen Gallery, Santa Fe, New Mexico, and was being sold for a Westchester County, NY Estate. Luis Jimenez (aka Luis A. Jiménez, Jr.) (July 30, 1940-June 13, 2006) was an American sculptor of Mexican descent, who was born in El Paso, Texas and died in New Mexico. He studied art and architecture at the University of Texas in Austin and El Paso, earning a bachelor's degree in 1964. His post-graduate work was done at Cuidad Universitaria, Mexico City, D.F. in 1966. He became an accomplished artist and taught art at the University of Arizona and later the University of Houston. Over the course of 30 years, Jimenez produced an extraordinarily consistent body of work informed by his highly developed craft skills, knowledge of art history and his particular placement in time. Jimenez was known for his large polychromed fiberglass sculptures usually of Southwestern and Hispanic themes. His works were often controversial and eminently recognizable because of their themes and the bright, colorful undulating surfaces that Jiménez employed. He was influenced by the murals of José Clemente Orozco and Diego Rivera. Jimenez was very much a contemporary artist whose roots were in pop art, as much as they were in both the modernism of the Mexican muralists and the regionalism of Benton and Grant Wood. Heroic scale sculptures were Mr. Jimenez’ forte, but his art was for the people. Proud of his Chicano heritage and working-class background, he championed the common man. In 1993, he was a recipient of the New Mexico Governor's Awards for Excellence in the Arts. In 1998 he received a Distinguished Alumni award from the University of Texas in recognition of his artwork. Jimenez was killed at age 65 in his studio in Hondo, New Mexico on June 13, 2006, when a large section of Blue Mustang, intended for the Denver International Airport, fell on him and severed an artery in his leg. The sculpture was based on the eight-foot-high sculpture Mesteño (Mustang), on display at the University of Oklahoma. 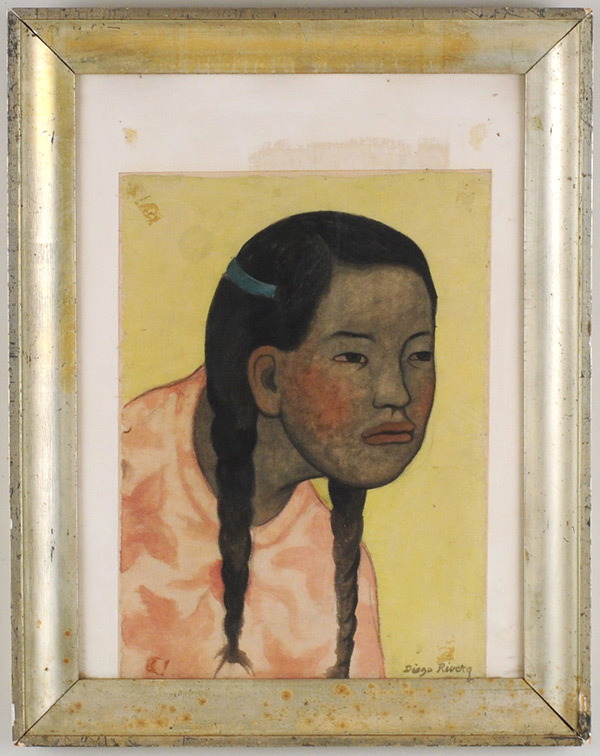 Next top lot was a watercolor on paper painting of a young girl by Diego Rivera (Mexican 1886-1957), one of Jimenez’ acknowledged influential predecessors. The work was 15" high, 11" wide, and went out to an internet bidder at $6,995. Provenance was the estate of Mrs. George S. Franklin, Oyster Bay and New York City. 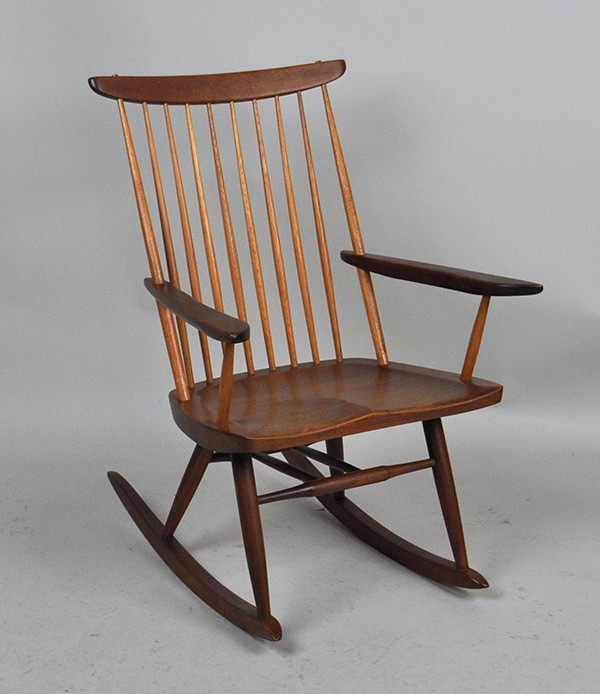 Prime among the estate lots sold was a George Nakashima Studios rocking arm chair, purchased by the consignor’s parents from the Nakashima shop in New Hope, Pennsylvania during the 1960’s. The chair, which bore a script “studio” written on the bottom of the seat, was in remarkably fine condition, with only minor expected age and use wear, and measured 35 ¼” high, 24 ¾” wide, 16 ½” deep. The chair carried a pre-sale estimate of $2,000-3,000, and sold to a phone bidder at $3,900. Several pieces of rare early Persian ceramics and pottery were offered from the estate of Ursule and Charles Cahn, including a Persian/Iranian pottery Rhyton cup, of gazelle form with raised eyes, stylized horns and front legs, the body extending into a conical shaped vessel. At 9 1/4" high, 9" deep, the cup sold to an internet bidder at $2,040 against a pre-sale estimate of $1,000-1,500. 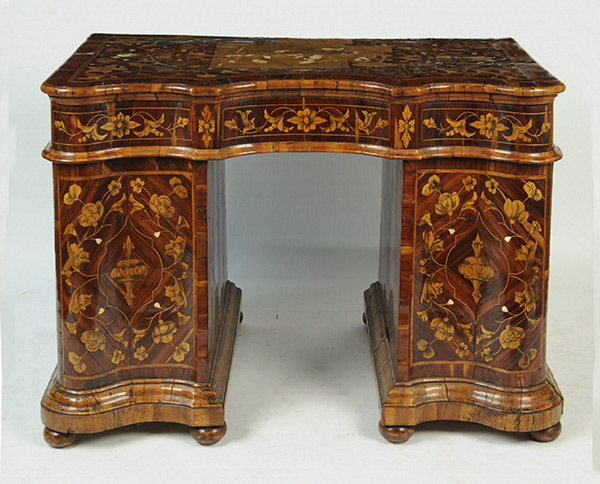 The top furniture lot was a rare Carrubo wood Italian Inlaid pedestal desk with a central panel depicting an aristocrat being offered gifts, profusely inlaid overall with flowers and gargoyles reminiscent of Renaissance decoration, and the facade of serpentine form, dating to the mid-18th century and measuring 48" wide, 29" deep, 32" high. The striking desk carried a pre-sale estimate of $1,200-1,800 and sold to an internet bidder at $5,700. A folk art carved wood ship’s figurehead of Lord Nelson sold to a phone bidder at $3,600. The half-length figure was dressed in Naval uniform with traces of original polychrome, and measured 66" high, 22" wide, 10" deep. The figurehead carried provenance from a Rhode Island private collector and was estimated at $2,000-2,500. Also selling well were a set of ten Russian porcelain lidded cups and saucers made by Kornilov Brothers in St. Petersburg, circa 1900. The set, in the Russian folk style, had been retailed by Shreve, Crump and Low and sold to an internet buyer at $5,700. Listed provenance was Property of a New York lady. 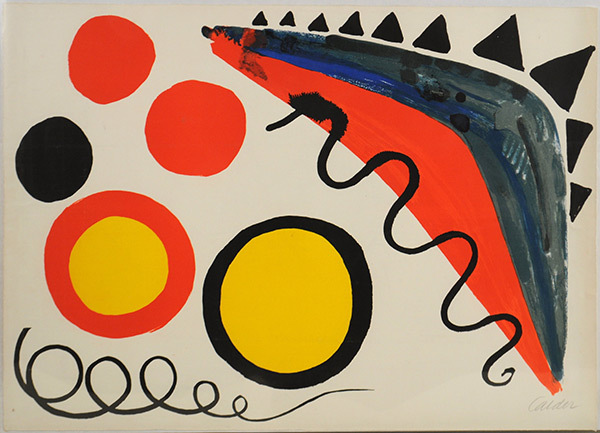 Selling to an internet bidder at $2,665 was a pencil signed lithograph by Alexander Calder (American, 1898-1976), titled "Cinq Boules Et Deux Serpents", from the edition of 90. The work was drawn and printed at the Studio of Arte Adrien Maeght, an edition issued by Galerie Maeght 1965, and was printed to the full sheet size as issued, measuring 21" high, 29 5/8" wide. The work was registered with the Calder Foundation under Application #A14605-UN3. The firm’s next sale is tentatively scheduled for Wednesday, May 23rd at 5:00 PM. To discuss consignments, or for additional information, please call the auction hall office at 203-266-0323.